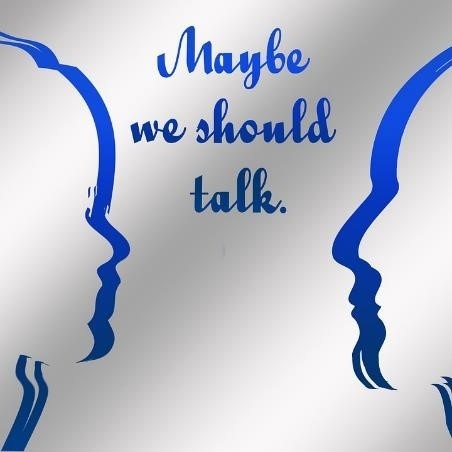 Should We Pay More Than Lip Service to Voice Banking? Talking is easier than typing (thanks, Captain Obvious). Voice assistants aren’t new, but there seems to be growing chatter about smart speakers and voice banking. Is it all just hype or should banks and credit unions be taking this seriously? To help answer this, let’s challenge some common assumptions. according to an August 2017 study from Google. Consumers are becoming more comfortable with voice assistants because their accuracy is improving. Voice recognition accuracy among voice assistants now exceeds 95% (the threshold for human accuracy). Most respondents (53%) from the Google study said talking to their smart speaker felt natural, and 41% said it felt like chatting to a friend. While voice accounted for 20% of searches in 2017, Google projects that voice will account for more than half of all searches by 2020. Gartner predicts that by 2019, 20% of mobile phone interactions will use voice assistants like Siri. Forrester projects that 50% of U.S. households will have at least one smart speaker by 2022 and that smart speakers will represent 68% of smart home devices. 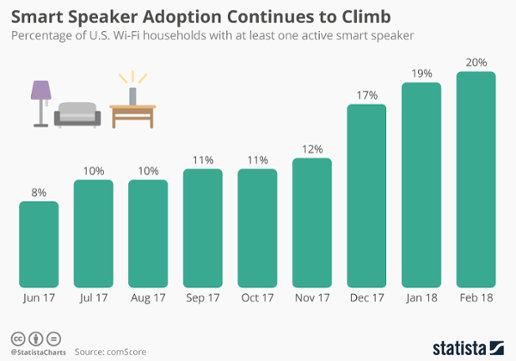 A recent report from comScore reveals that nearly 20% of U.S. Wi-Fi households own a smart speaker (as of February 2018). Smart speakers are selling faster than augmented reality, virtual reality or wearable devices. 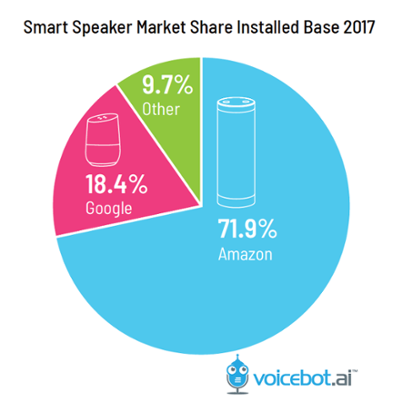 While Google and Apple have launched smart speakers, Amazon dominates market share (nearly 72% of the market). During the 2017 holiday season, Amazon sold “tens of millions” of Alexa-enabled devices worldwide with the Echo Dot as their top-selling product. More than 4,000 smart home devices from 1,200 unique brands feature Alexa. Right before I/O, Google announced that Google Assistant now works with 5,000 smart devices and every major smart home partner. CapTech conducted a nationwide study of nearly 1,000 U.S. consumers and found that in terms of satisfaction and usage, 65% use their smart speaker four or more times a week and 81% say the experience meets their expectations. Research supports that smart speakers are more than a novelty gadget. Rapid consumer adoption may signal that voice will become the new UI. Does voice banking appeal to more than just millennials? Javelin research tells us yes. 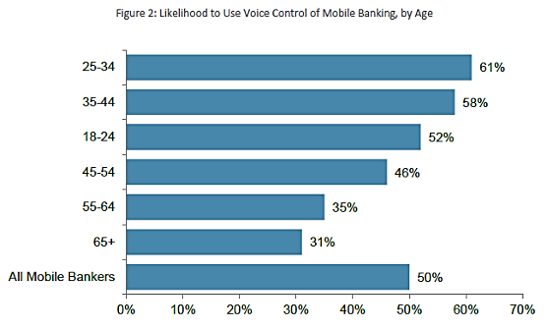 Most consumers age 18-44 are likely to use voice control for mobile banking as are 46% of consumers age 45-54. Voice banking appeals to all age segments. The “typical” smart speaker owner is a young married couple (73.5% of smart speaker owners were married) who are starting to get to the higher end of their salary potential, probably with kids, and own a home (77% of smart speaker owners owned their home). They are slightly more likely to live in the city, but they also live in the suburbs in larger numbers. CapTech reports that just over half (53%) of smart speaker owners are millennials or younger, 32% are Gen X and just 12% are Boomers. While all age segments use smart speakers, current adoption is strongest among millennials and Gen X. According to Invoca, in 2017, over half of voice speaker owners asked about hotels, checked a banking balance or paid a bill, and asked about a health symptom. As consumers look to perform more tasks using their smart speakers, the growth of voice apps is booming. 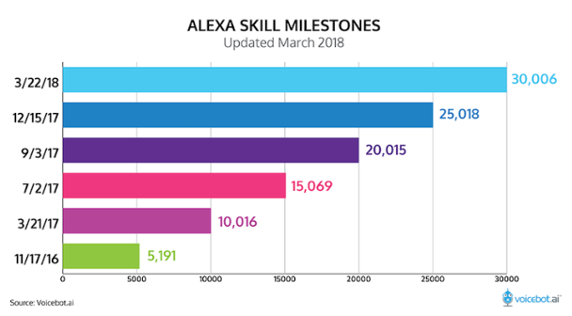 The number of voice apps for Alexa, called skills, exceeds 30,000 (including more than 730 banking skills categorized in “Business and Finance”). In comparison, the Google Home smart speaker (with the Google Assistant) has an ecosystem of nearly 2,000 voice apps, called Actions. According to Voicebot.ai, Amazon’s developer ecosystem is creating about 5,000 new Alexa skills every 100 days. Consumers are projected to spend $2.1B using smart speakers by 2020. Voice shopping is quickly emerging as an easy way for consumers to order a variety of products. In fact, 35% of smart speaker owners have bought products using their device. As the technology advances and voice shopping popularity increases, brands will have more opportunities to market and sell their products to smart speaker owners. Will people really use voice banking? Javelin research tells us yes. 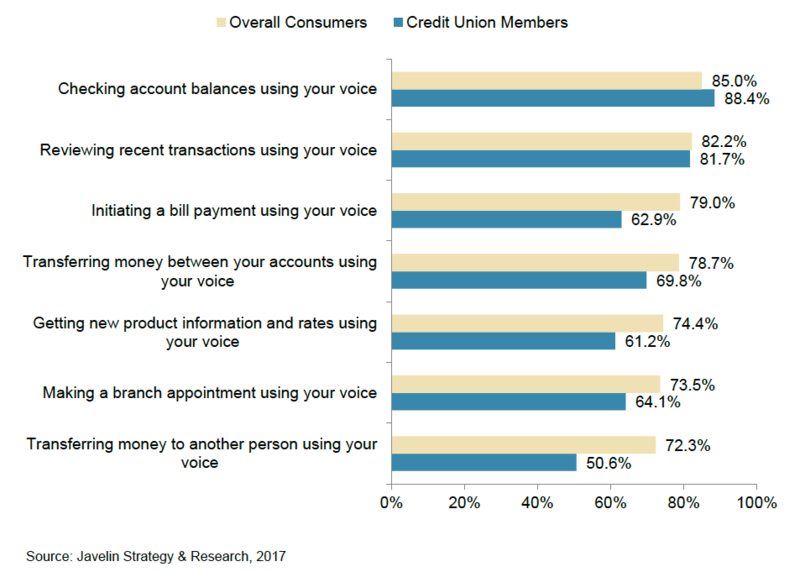 The chart below shows us consumers’ likelihood to use voice banking (overall consumers compared to credit union members). It’s notable than more than 72% of consumers would use voice banking for every use listed (including non-transactional activities like making a branch appointment and getting product and rate information). by Amazon," makes it possible to create up to 10 unique voice profiles, enabling Alexa to personalize its responses for everyone in the home. Amazon recently made this feature available to third-party developers to enable them to create apps that are more personalized to each member in a household to better personalize their experience. Amazon managed to pull ahead of Google on this front, but Google has released support for distinguished voice profiles (without third-party app developer support). “measure” section of the enhanced developer console provides developers with metrics on sessions, unique customers, utterances, as well as a cohort analysis they can use to visualize customer retention and engagement over time. Having access to more data will help developers roll out incremental improvements to their voice apps to increase engagement and retention. While smart speaker voice assistants may not be mature enough to become our primary interface, they’re getting more personal. As artificial intelligence, natural language processing, and machine learning advance, the sophistication of functionality and personalization will evolve. Smart speaker adoption is growing (and fast). While voice banking appeals to all age segments, the profile of the typical smart speaker user is attractive to many FIs – young millennial couples with discretionary income who have deposit, loan, and investment product needs. Consumer acceptance and usage of voice assistants is on the rise. Consumers will begin to expect their bank or credit union to serve them through their smart speaker. That’s the complexity of channel proliferation … it’s never either/or, but and/and. Banks and credit unions not developing their voice channel strategy risk falling behind or being left out of the conversation. Do you have an assumption about voice banking that wasn’t explored? Please share what you’d like to see covered in a future post.